Kids are drawn to science because the natural world is just so exciting and most of them don't get enough of it. With screens distracting them from the real entertainment that is right under their nose! You need these 10 Science Books for Kids in your home to inspire your children to explore and discover the world around them. Easy experiments, answers to questions, and visual guides make these books must-haves. There's something for every child, and you won't be able to put them down yourself. 1. Look Inside Your Body The first book to introduce science to a very young child is an easy pick. It is one about our bodies! Children love to talk about their body. Help them understand how their body works and how to take care of themselves with this lift-the-flap book. Try this simple Anatomy Sidewalk Chalk Activity to go with it! 2. Big Book of Big Animals Another great way to introduce children to science are through animal books. This book really is BIG, with durable fold out pages that contain information on some of the biggest animals on the planet. Did you know a blue whale is bigger than the largest dinosaur? Find out more with this animal science book for kids! Then, use some clothespins to make your own BIG animals. 3. Look Inside Our World What is the earth made of? Where do we live? This book is both an introduction to geology and geography! It has over 60 flaps with simple answers to complex questions. Pair it with this location nesting boxes activity and remember to remind your kids that God made the world. 4. 365 Science Activities Discovering something new is easy because of the activities in this book. You'll have a years worth of ideas and more because your child will want to do these over and over again. Each time you can add more details to further their understanding. Need something to record your findings on? Try a free experiment worksheet printable. 5. See Inside How Things Work Engineering and science combine in this lift-the-flap book. Answers to questions like, what happens when you flush a toilet, or what goes on inside a light bulb will be answered for inquisitive minds. They will definitely be inspired to make something of their own. 6. Elementary Illustrated Science Dictionary It may sound boring because of the word 'dictionary', but this is one book that you'll want on your shelf. It has simple explanations to basic science principals that every child should know. You can work through the book by subject for a curriculum if you're homeschooling, or use it as a starting point to plan an experiment. 7. Book of Science Activities Vol. 1 This book explores in more depth, water, light, mirrors and magnets with easy to duplicate experiments and activities. The 2 other volumes explore batteries, the body, weather, plants, and air. A fascinating look inside a tough job, this book describes how small pieces of evidence can be used to solve a crime. Kids will love reading about real life crime stoppers. 9. What's Physics All About? Why do things do what they do? Physics may sound intimidating, but if you have a scientist in the making, this book will fascinate and motivate them to learn even more. It makes physics exciting and easy to understand! You can't find a better science encyclopedia because this one contains 2,500 scientific terms, over 1,500 illustrations and diagrams, over 140 experiments, activities and observations to carry out, a quick reference dictionary defining over 1,500 scientific terms and test-yourself revision aids. If that isn't enough, this book contains links to reputable sites you can go to for more information and all for less than twenty dollars. 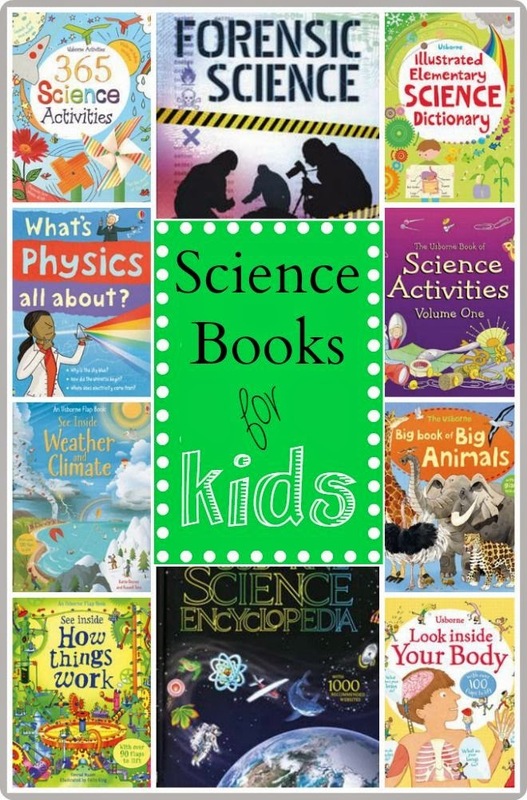 Find even more science books in the Usborne Books & More Store. Please join us on July 13th for a quick Facebook party and giveaway. We'll share some literacy tips and show inside some of these amazing books. To enter to win, please RSVP on Facebook.